It's been a little more than a week since Timiyah Landers was burned over 50 percent of her body while attempting the "fire challenge" she reportedly had seen on YouTube. (NEW YORK) — When Brandi Owens saw her daughter, Timiyah, running toward her engulfed in flames, she shut down. It’s been a little more than a week since Timiyah Landers was burned over 50 percent of her body while attempting the “fire challenge” she reportedly had seen on YouTube. Covered almost head to toe in heavy gauze bandages, the 12-year-old has been relying on a feeding tube and a respirator as doctors treat the second- and third-degree burns that cover 50 percent of her body. “Then I heard some kind of pop. I asked my fiance, ‘What was that?’ Next thing I know, my daughter is running down the hallway yelling ‘Help me!’ She was on fire from her knees to her head. I panicked. I screamed, ‘My baby! '” Owens said. Now, instead of getting ready to go back to school, Timiyah is undergoing multiple operations at the Children’s Hospital of Michigan to remove her severely burned skin, her mother said. Her family is left wondering how their daughter — a “very outgoing, very outspoken” girl who loves volleyball and was a “little mother” to her classmates — came to set herself on fire. And Timiyah’s family is far from alone: a number of children have been seriously injured or died after attempting dangerous social media “challenges” involving boiling water, detergent pods, bath salts and fire, among others. Scheff said children and teens are also highly susceptible to peer pressure, and it starts earlier than most parents realize. Last year, an 8-year-old Florida girl died months after drinking boiling water through a straw after being dared by her cousins to do so as part of a “boiling water challenge” they said they saw on YouTube, ABC affiliate WPBF-TV reported. Ki’ari Pope suffered severe internal burns in the March 2017 incident and died on July 31, 2017, after complaining about having difficulty breathing. The Florida Department of Child and Family Services had investigated the boiling water incident and other incidents related to the girl, the Palm Beach Post reportedat the time. 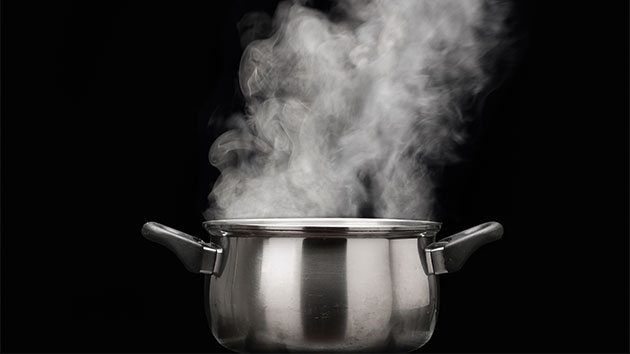 Last month, a 15-year-old boy in Indiana suffered severe burns on his face and body after he said his friend poured boiling water on him while he was asleep as part of the same challenge. Kyland Parker said he and his friend watched a video about the challenge online before the incident. Earlier this year, poison control centers reported a surge in teens attempting the so-called “Tide pod challenge” in which they bit into laundry detergent packets. Laundry detergent is poisonous to humans and animals and can cause serious health effects including “breathing problems, damage to the esophagus from the corrosive ingredients, burns, blood pressure changes, gastrointestinal problems and neurological symptoms, including loss of consciousness,” according to Dr. Sarang Koushik, a resident in ABC News’ medical unit. The American Association of Poison Control Centers reported that during the first three weeks of 2018, there were 86 cases of 13- to 19-year-olds intentionally ingesting detergent pods. The CEO of Proctor & Gamble, which makes the Tide pods, issued a statement in January addressing the dangers. “As a father, seeing recent examples of young people intentionally take part in self-harming challenges like ingesting large amounts of cinnamon or the so-called ‘Tide Pods Challenge’ is extremely concerning,” Procter & Gamble CEO David Taylor wrote in the statement. “The possible life-altering consequences of this act, seeking internet fame, can derail young people’s hopes and dreams and ultimately their health. Taylor also said at the time that the company had taken a number of measures to stop the dangerous trend and promised to remove videos that glorified the challenge from social media networks. “Let’s all take a moment to talk with the young people in our lives and let them know that their life and health matter more than clicks, views and likes,” Taylor added. But clicks, views and likes can be a powerful motivator for young people, Scheff said, and a group of children might attempt something riskier than an individual child would on his or her own. Owens said she does not yet know which of the three girls’ idea it was to light Timiyah on fire. She said rubbing alcohol might have been involved as well. “I’m not going to really know the truth until Timiyah is able to talk,” Owens said, adding that the police are not involved in the matter at this time. Frequent conversations between parents and their kids are key to combatting peer pressure, Scheff said. Still, Owens, who is the mom of three other girls and a boy, said those conversations with Timiyah didn’t prevent the tragic incident. For its part, YouTube said it has long had policies that prohibit videos like the fire challnge, Tide pod challenge and boiling water challenge. “YouTube’s Community Guidelines prohibit content that’s intended to encourage dangerous activities that have an inherent risk of physical harm or death. We remove flagged videos that violate our policies,” a YouTube spokesperson told ABC News in a statement. But it can be hard to keep up with flagging and removing videos, and parents also need to worry about what their kids’ friends are watching and sharing. “Talk to your kids a little bit more, because you never know what another child is doing at their home and then coming to your home and introducing to your child, that they have no clue of,” Owens said. Timiyah is expected to make a full recovery, her mom said. But Owens hopes sharing her family’s painful story will help others prevent the same thing from happening to their children.